There are times when you have to put a marquee up and the customer isn’t around for whatever reason, my advice is to be very careful and have an accurate diagram or get the customer to mark out where it’s going. I remember I attended one wedding we did where the groom turned round halfway during the evening and told me the marquee was in the wrong position. What can you do at that point other than apologise? It turned out he wanted a different layout but failed to pass that on to us until half way through his wedding, we just put it up as the original plan. Sometimes people can’t be there when you put up the marquee, the ideal would be they mark out where they want the marquee but if not get a very very clear diagram. Instructions given over the phone (“near the hedge” etc) can only go wrong. I’d also be tempted to put a line in your terms and conditions saying if you have to go back and move the marquee there would be a charge just to cover yourself. What’s the difference between party tents and marquees? In a word, nothing. Well that was a short blog..
2. Is calling a commercial grade marquee a party tent an insult? Not really, most of the rest of the world don’t use the term ‘marquee’ they refer to all structures as party tents including ones 30m wide. The only countries that regularly use the term ‘marquee’ are the UK, Ireland, Australia and NZ to my knowledge. You imagine that the rival in question above uses the over-engineered aluminium frame marquees for his 6m, so what’s your response? You could try explaining the business sense of using our marquees, you could ask him as he pays over the odds for his 6m marquees does he also use a diamond-encrusted hammer to do his matting? Personally I wouldn’t do either, what’s the point in educating him? All he’s then going to do is copy you and buy our marquees -let him use the more expensive ones while you have the higher return on investment. How much is my marquee hire business worth? And why do I need to know? Well from a start up point of view you might be looking at whether to buy an existing company or start it yourself. You may have built up a business and thinking of selling for whatever reason, or you may just be nosy at how much your business is worth. The first lesson seems to be that it’s never worth as much as the seller thinks its worth. The second is that turnover has very little to do with the value of a business, it’s all about the value of stock and the net profit. Investors will always look to get their money back within 3 years (less in the current climate) so the value will rarely exceed 3 times net profit. Remember net profit is the amount left over after you (or someone qualified to do your job) has taken out a wage as well as all other costs. As a buyer (or as a seller looking to increase the value) you’ve got to look at if you can cut costs and increase the profit while keeping the same turnover. You’ve got to look at the value of the stock and if it’s been replaced recently – if people are winding up a business or if they’ve been extracting as much money as possible for a few years then chances are the equipment is old, hasn’t been replaced and will affect future business. The final thing to look at for a marquee hire business is bookings – are there many future bookings already in place? How much of the existing business is repeat business? – This is worth a lot as you know year on year you’re getting some returns on investment. After all that -if you can buy a business for the value of the stock or less and it has no liabilities then you know you’re on fairly safe ground. I’m not an expert on selling businesses but I did go through the process a few years ago and I’ve been involved in buying and selling a few businesses over the years. My best mates favourite anecdote about my Dad is of joining us on a long car journey and being handed several sets of accounts to value businesses for an hour when we were 12! Posted in marquee hire advice, Selling/Buying marquee hire business | Comments Off on How much is my marquee hire business worth? We’re getting rid of some old stock where the boxes have been damaged or the roofs have been repaired, they’re listed on Curlews second hand marquees website. If you’re not already on their mailing list sign up now! It’s the place to go for second hand kit. 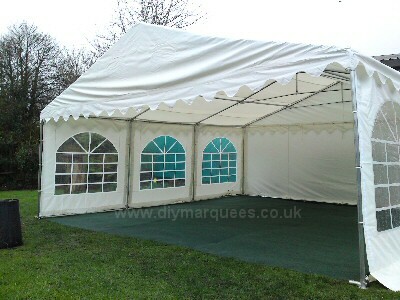 I’ve mentioned before that if you’re connecting a marquee up to a house it’s a LOT easier if you can orientate the marquee so you have the flat gable end up against the doors opening inwards. This avoids the need for guttering and there aren’t any eaves rails along the gable to obstruct the door. I was reminded of a possible problem with this while speaking to a marquee hirer last week (apologies, I forget who -I have a terrible memory). People often fit floodlights above back doors. People often forget they have a marquee outside when turning on said floodlights (or don’t notice it’s been switched on). This is not good. Whilst any good quality marquee will be flame retardant it doesn’t stop the floodlight melting a scorched hole in your gable meaning an expensive repair or replacement (and a nasty smelling marquee). Check for floodlights, put a sticker on the light switch inside the house so the customer remembers. On Saturday I left my young family to come in to work, it’s not something I make a habit of doing but someone wanted to discuss setting up their own marquee hire business so you make the effort to help out. Chances are if you go out visiting people then at some stage you will turn up and they’ll have forgotten and/or won’t be in. It’s very frustrating but don’t lose the business by reacting badly – leaving a note through the door saying ‘I turned up but you couldn’t be bothered!’ might not win you much future business.  Phoning the customer up soon after apologising that you obviously had the time wrong and please can we make an appointment at a different time might mean you still get the job (if they have a conscience you’ll have a headstart on anyone else at least). Last week we put up a 6mx6m DIY Marquee for the pub at the back of our factory, it’s going to stay up all summer so if anyone wants to view a marquee feel free to go round any time with or without us. People who have visited our factory will know we don’t work in the lap of luxury here (our desks are fitted in around the stock not the other way round), we don’t have a nice showroom. So having a marquee at the back of us is very useful. Hopefully we’ll get time to fit a marquee lining but there never seems enough hours in the day. Incidentally it took us 55 minutes to erect but we reckon if we weren’t explaining to the people watching and ran a bit we could get it down to 45mins. one incident of a competitor copying our instructions! Copying our designs I can understand, just because we were the first people to offer this style of marquee with 500gsm PVC, linings, groundbars included etc doesn’t mean no one else can do it. It’s always flattering having people copying you but I (understandably) draw the line at stealing. 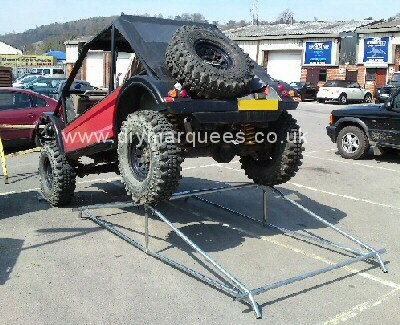 Try and check out other marquee hire companies, especially local ones just to make sure no one is stealing your photos. Commission: Greed, bribe or part of business? In the marquee hire business commission rears its head from many places. People see you taking £1k for erecting a marquee? They want a part of it. Some are deserved, some aren’t and some fall in between where you have to judge if it’s a sound business idea or not. There are some sites like National trust properties where part of the agreement in being on the ‘recommended suppliers list’ is paying 10% commission. Whether you increase your normal charges by 10% or pay it out of your normal prices is up to you in all of these cases. Some caterers ask for commission for any work you pass across and offer in back for return business. Personally I’m not keen on this. Recommendations between people in the industry should be based on a genuine recommendation otherwise it could reflect badly on both parties. Would you choose to recommend someone so you can take commission over someone you knew could do a great job? Wedding suppliers, wedding coordinators, wedding directories all promise to bring you a whole host of new marquee business in return for commission. To me this is a step too far but hey it’s up to you. I know of 2 fatalities that have happened in the marquee industry and whilst I wouldn’t expect you to be in the same circumstances it does show that you should be careful. I should point out that neither of these happened at our company, the closest we ever came was my old mate Dougie standing on a roof rack waving round 6m long metal beams in a thunderstorm in Regents Park. We were all laughing until lightening took down a tree 500 yards away and we nearly needed a change of underwear! This was very similar to Dougie’s metal beam waving but replace thunderstorm with overhead high voltage power cables. Not good. Now if you’re using our standard marquees the longest pole is 2m so this shouldn’t be an issue but personally I still wouldn’t put a marquee up underneath power cables. It may seem like common sense but remember to look for this when inspecting any site. Sometimes you need more power than standard extension leads will give you. At this point you should either hire a generator in or get an electrician to connect a large mains supply across to the marquee. What you shouldn’t do is try to connect an electrical supply yourself if you’re not qualified – that’s what this guy did with fatal consequences. Any industry will have it’s nightmare stories and marquee hire certainly isn’t high risk but use some common sense. My last point is something I remembered the other day, and that was the number of times we used to turn up to a garden and the customer hadn’t cleaned up all the dog mess in the garden. It’s genuinely unpleasant and technically from a health & safety point of view is probably a health hazard. Yes you can borrow a shovel but the best thing is to politely mention to any dog owning customer to please ensure their garden is clear before you arrive.